Hi, Great stuff! I really like this and thought I'd have a go.. 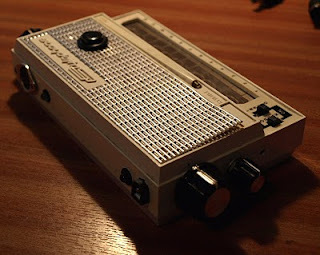 I've got a modern Stylophone but they don't have the old resistor ladder arrangement so I wanted to make my own using resistors of the same value. I experimented with a pre-set pot and changed the hex values in the code which helps a bit, but all the notes are crammed together at one end - kind of exponentially. Any idea what I'm doing wrong? Thanks and keep up the good work! Hey, yeah I believe you will need to change the values in the scale array.. this array depends on the voltage the code expects to read from each pad on the stylophone and depends on the resistors you use. The easiest way to work out the values to use is to print out the values from the ADC input of the PIC depending on which pad you connect to with the stylus.. these come back from the expression adcResult[ADC_KBD] in the main loop of the code. You will need some way to print them to a serial port etc to see them (I wrote them to MIDI pitchbend messages and used MIDIOX to look at the MIDI trace to read the values - just remember each byte of MIDI only has 7 bits). The alternative way is trial and error... if you can work out the right ADC values for first and last pad you should be able to get the others by division - assuming all your resistors are the same value (and you may need still need to tweak the values a bit if a pad is flicking between 2 different notes). Hope that helps! Could you make a simple instruction video for you-tube to show exactly how to achieve this. Perhaps you could start by showing how to install the midi to the stylophone and also how and where to put your program on a pc. 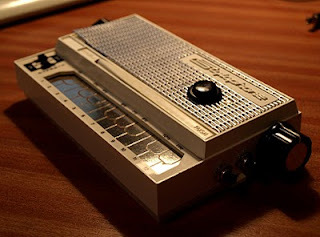 It would help if you showed us using one of the new modern versions of stylophone as well. I think what you have achieved is fantastic but I'm not as skilled as you so I need lots of tuition. Thankyou.